Muskerry News | American tourist saved by the kiss of life! Great article by Eoin English in the Irish Examiner last week featuring local woman Siobhan Hogan, Blarney Community First Responder Jeremy Downey and all those who helped save the life of American tourist David Motte last April. David came back last week to thank all those who came to his aid when he went into cardiac arrest whilst visiting Blarney Castle, and to complete his journey to the top of the Castle! Eoin English wrote, “His last visit to one of Ireland’s most famous tourist attractions ended in drama but it was all about hugs and tears of joy as US tourist David Motte returned to Blarney Castle to say thank you to those who saved his life. David, from North Carolina, and his wife, Joy, scaled the castle effortlessly and kissed its stone just five months after his dramatic airlift from its ramparts in cardiac arrest. Speaking while overlooking the confined space from where he was winched aboard a Coast Guard helicopter, he said: “Looking at this now, I can’t believe what they did to get me out of here. “I was a goner — I shouldn’t be here. I’ve been told that by every doctor I’ve seen that I shouldn’t be here today, that I beat all the odds. It was a miracle. That’s the bottom line. I am so thankful to the people who risked their lives and their safety to do that. 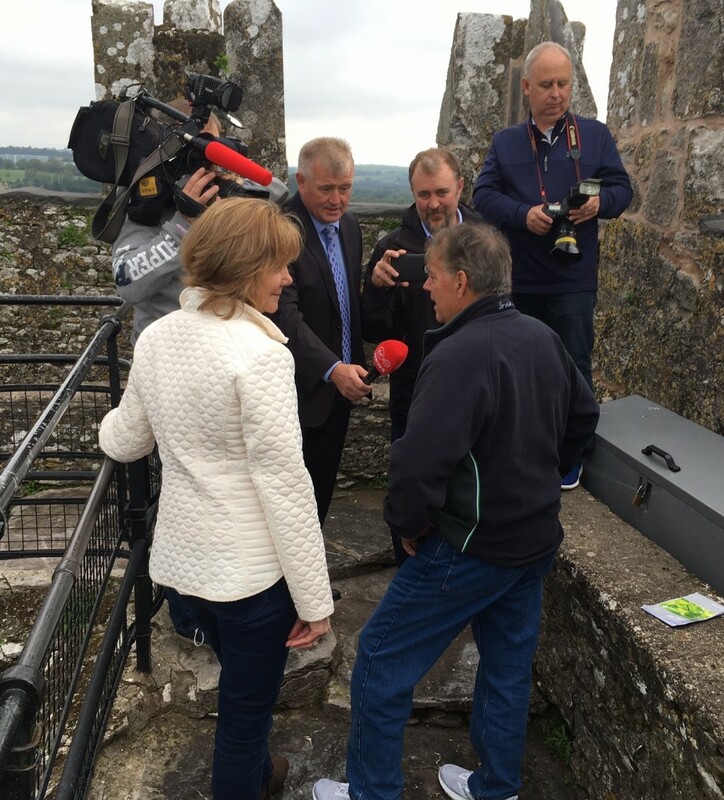 David and Joy, who arrived in Ireland last April to trace Joy’s Irish heritage, were close to the top of the castle on April 20 when he collapsed with cardiac arrest. “The only memory I have is when I was out, in the castle, when I was gone, but my memories aren’t in this world,” he said. “But I was aware that I was gone. I was aware that God was holding me. “I was very clearly aware of being in God’s presence, of him holding me, and of incredible love and peace, and at a particular moment in time it was like he allowed me to come back. “I remember moaning and fighting and trying to lift my head, and I was terrified at that point because I felt I had left something I didn’t want to leave. And then I heard Joy’s voice in my ear saying ‘David it’s OK’ and at that point I remember relaxing and the next thing I remember is being in hospital the next day.